SBS will broadcast the upcoming women’s football international between the Westfield Matildas and France from the Stade Jean Bouin in Angers LIVE this Sunday 7 July at 4:30am on SBS ONE and online. 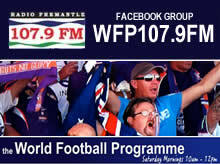 With the French team making it to the semi-finals of the 2011 FIFA Women’s World Cup, the Westfield Matildas will have the opportunity to prove themselves against one of the world’s best teams. The last time these two teams met was in 2001 in Coffs Harbour when the Westfield Matildas won 2-1. Out of four previous meetings, the Westfield Matildas have defeated France on two occasions with one draw and one loss. The match will be hosted by David Zdrilic with former Socceroo Craig Foster. Former Matilda Sarah Walsh and SBS football reporter Vitor Sobral will provide commentary. The match will also be streamed live online at www.sbs.com.au/theworldgame. France v Matildas is LIVE 4:30am Sunday 7 July on SBS ONE and online.